When the Northeast Consortium was just getting off the ground in 1999, it was common to hear the fishermen's refrain, "Anytime I provide information to the government it comes back to bite me." That is, giving fisheries managers catch data could very well lead to sanctions and a loss of income. "Getting people to realize that it is to their advantage to provide data about the species they're catching was a big hurdle to overcome," Northeast Consortium director Chris Glass says. "As a rule, the more and better data you have the better managed stocks will be, and the access the industry will have to those stocks will likewise increase." That refrain can likely still be heard somewhere out on the high seas but, today, cooperation rather than confrontation is occurring as never before. 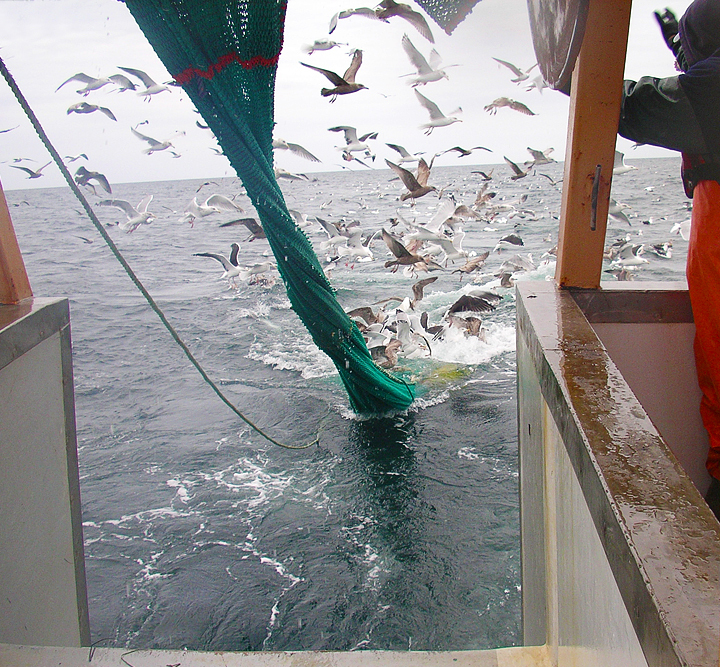 Beginning a few years ago, NOAA's fisheries survey vessel Henry B. Bigelow started including several fishermen as part of the onboard crew during surveys of groundfish stocks in the Northeast. "It's a huge step forward in terms of the whole trust-building aspect between the different players, and I do think the consortium's approach contributed in some small fashion to the culture that helped NOAA make that decision," Glass says. 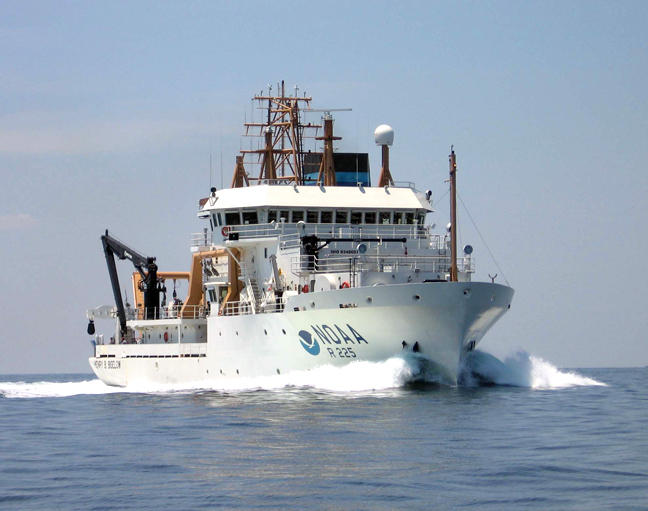 The Henry B. Bigelow is the second of four new fisheries survey ships to be built by NOAA and is one of the most technologically advanced fisheries survey vessels in the world. The ship supports NOAA's mission to protect, restore a nd manage the use of living marine, coastal, and ocean resources through ecosystem-based management. 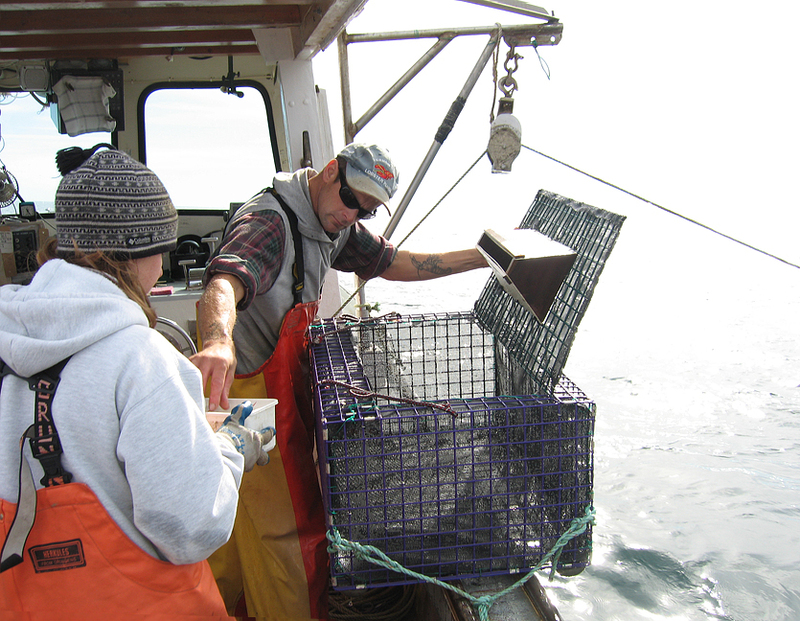 Its primary objective is to study and monitor northeast marine fisheries, throughout New England. The ship also observes weather, sea state, and other environmental conditions, conducts habitat assessments, and surveys marine mammal and marine bird populations. According to Glass, in part because of the Northeast Consortium's efforts to build alliances between fishermen, scientists, and government managers, fishermen have come to realize that when they are given the opportunity to get directly involved in this process of data collection they are more apt to trust those data; any perceived veil of secrecy is removed. "They feel more invested in those data and trust them," Glass says. "That said, fishermen have had to learn to accept that when doing collaborative research, you've got to be prepared for whatever the answer is – it may not be something you particularly like and you can't cherry-pick it to your liking. On other hand, the data can also open up other unexpected opportunities." Over the last decade a dramatic, positive shift has occurred between the fishing industry, the scientific community, and government regulators – and the Northeast Consortium has played a key role in the process. 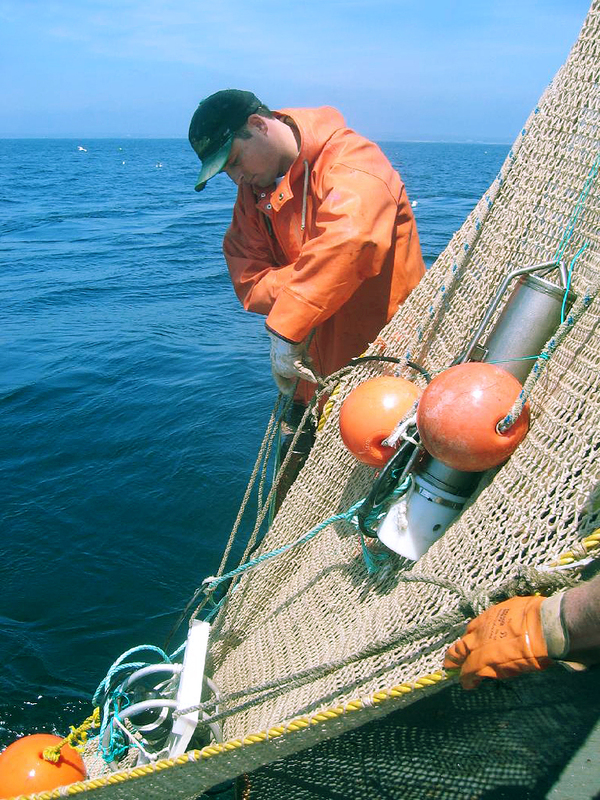 TWELVE YEARS AGO, when the Northeast Consortium began, New England fisheries looked radically different than they do today. In a word, back then the fishing industry was a wreck; stocks were heavily overfished, restrictions were being imposed and fishermen were being shut out from some of the places they had traditionally fished. Quotas and days at sea were reduced, and economic hardship was on the rise. 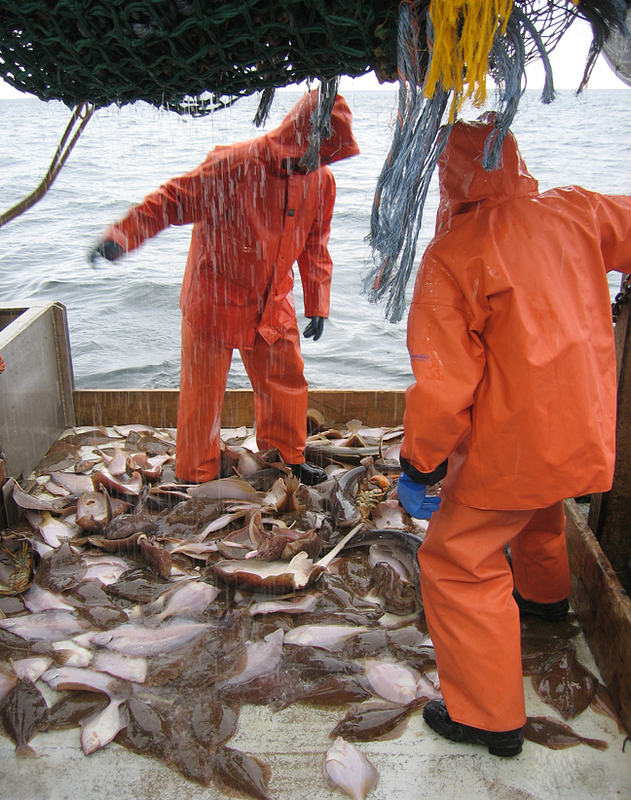 So for an industry that perceived itself to be the most heavily regulated in the country and was suspicious of intervention from "outsiders," attempting to team fishermen up with scientists in such a dismal climate might have seemed like a crazy idea. Testing a grate to keep dogfish out of a whiting trawl. Photo by David Chosid, Mass. Div. of Marine Fisheries. To be sure, there was plenty of resistance and it has been an evolutionary process, but according to Northeast Consortium director Chris Glass, at the time there was an imperative for fishermen to try and do something not just different, but that was going to lead to some form of sustainability and, ultimately, survival. "You see the most innovation and creativity when people bump up against something that is completely unpalatable," says Glass, a professor in the Ocean Process Analysis Laboratory. "Like when you tell people a fishery will be closed down unless they do something different. That's when you see the most creativity." When it began in 1999, the Northeast Consortium was itself a highly creative and innovative effort to encourage and fund effective, equal partnerships among commercial fishermen, scientists, and other stakeholders to engage in collaborative research and monitoring projects in the Gulf of Maine and Georges Bank. The consortium is comprised of four research institutions – UNH, the University of Maine, Massachusetts Institute of Technology, and Woods Hole Oceanographic Institution – working together to foster this initiative. Modifying a lobster trap to sample juvenile shrimp. Photo by Chris Manning, UNH-EOS. At the heart of this progress is the trust that has been slowly cultivated over the years between historically disparate partners. Says Glass, "Through the years the consortium has achieved a great deal and at many different levels, but the one biggest achievement I think has been the building of trust between the industry and the scientific community." He adds, "Some people may dismiss that as being too warm and fuzzy, but if you look at all the things we've been able to get done regionwide, for example, the changes in regulation, how we manage things, the data we now provide to the Fisheries Service to help manage stocks – without the trust building and engagement from all the stakeholders none of that would have been possible." Essentially, the effort offered a carrot to an industry beset with troubles rather than waving a big regulatory stick as a means of bringing back the fish – the latter being a Draconian approach that Glass says he doesn't necessarily subscribe to. And indeed, this is a perfect example of a creative approach being used to drive innovation in the face of unpalatable consequences, and one that forced a change not only on the part of the industry but on the part of the scientific community as well; both camps ultimately realized there were opportunities for partnering. "It wasn't always easy at the start," Glass notes, "the scientific community had to learn how to work with the industry more effectively and the industry had to learn they didn't need to be scared of the scientists, that we've got a lot to offer each other. And what we found was that once you begin to make those connections it becomes a fertile area for getting things done." A fisherman installs an underwater camera on this shrimp trawl net. Photo by Pingguo He, UNH-EOS. That fertile ground has moved to various spots around the globe where the Northeast Consortium approach has been adopted and adapted. In Holland, for example, researchers familiar with the consortium's method of involving fishermen in developing new strategies for fishing ultimately led Dutch scientists and fishermen to get together in local area "knowledge circles," in which fisherman meet with scientists and managers to talk about their issues and try to develop ways of solving problems. "It's led to nearly an explosion of creativity in how they run their fishing operations. It hasn't solved all problems by any means, but I see that as being the way forward," Glass says. Glass also sees what he calls "big thinking" as the only way the fishing industry will be able to go forward in a sustainable way. This is in the realm of think-tank work, which doesn't necessarily come up with specific answers but, rather, poses questions that make people think expansively and creatively about what they're doing – fishing in this case – how they're doing it, and how they could continue to do it in some fashion in the future. "Conceptually, for example, what we need to be doing is asking things like, Are the species we're focused on now the most appropriate species for the future? Are the fishing methods we use now the most appropriate for the future?" 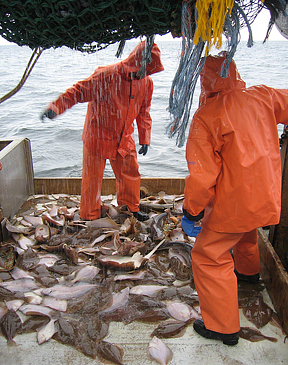 Counting species in the catch. Big thinking would put a big spotlight, for example, on the appropriateness of continuing to fish using a century-old design like trawl gear, which has increased impact on the sea bottom and its inhabitants using today's bigger engines and stronger twines. "It's a hundred years later and we're still using this same fishing method," Glass says. "If someone came from another planet, didn't know anything about fishing, and was asked to come up with a method to harvest fish from the ocean, they might dream up something radically different." Indeed, some of the big thinking going on right now isn't being done by aliens but seems otherworldly for sure. According to Glass, there are a number of initiatives looking at using laser light or other sensory stimulation devices to herd or aggregate fish. It's not farfetched, he asserts, to think about replacing most of a trawl net with non-physical structure such as a system of lasers that might form a visual lattice to create the illusion of a net to catch fish virtually. Such a high-tech approach would have no impact on the seafloor and could potentially be more species-selective thereby cutting down on bycatch and waste. "This is all conceptual stuff but people are starting to experiment with things like this. It's a long way off but I think we need to have people who are thinking along these lines right now," Glass says. "There are actually some initiatives in other parts of the world, for example, that would use large enclosures on the seafloor with a system of runway-like lights to attract fish into these pens. The fish basically catch themselves." A little less "out there" but still involving big thinking, were discussions about global fisheries issues Glass was invited to participate in last summer at the Southeast Asian Fisheries Development Center (SEAFDEC) conference in Thailand. With delegates from all over Southeast Asia, and under the banner of "Fish for the People 2020: Adaptation to a Changing Environment," the conference tackled the issue of food security in the context of global warming and rising ocean temperatures, sea level rise, and escalating fuel costs, among other things. "One of the themes of my presentation was that of ballooning fuel costs and the notion that what we'll be fishing for, and how we'll be fishing ten to fifteen years from now will likely be very different from today," Glass says. 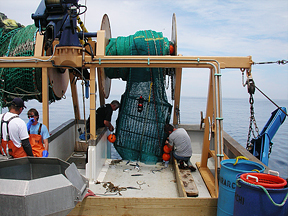 An experimental trawl net being hauled back into the boat. He adds, "If fuel costs double in the next five years, which is not unlikely, that sets the framework for how we position ourselves both with regards to fisheries science and also with what fisheries we're going to pursue and how we pursue them. It's likely to move us away from bulk fisheries to high-quality, high-price species, and in order to do that we're probably going to have to fish differently using different methods." But at the heart of Glass's SEAFDEC presentation was this notion of thinking outside the box. That is, rather than focus on specific aspects of fisheries, the industry, scientists, and regulators need to be thinking in a more holistic manner about the whole process of fishing. Even at the level of the Northeast Consortium, Glass asserts, the thinking needs to encompass the bigger picture if sustainable fisheries are to be part of the future. "The consortium obviously has a geographic mandate, which is the Gulf of Maine and Georges Bank ecosystems, but as part of my role within the International Council for the Exploration of the Sea and as consortium director, it's my job to look at this more global approach."